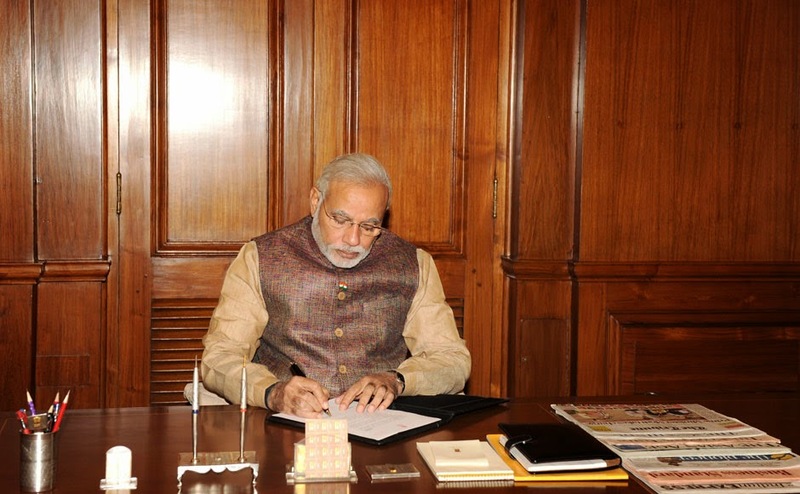 On 26th May 2014, Narendra Damodardas Modi (63) was sworn in as the 15th Prime Minister of India in an impressive function at the official residence of the President of India, the Rashtrapati Bhavan, New Delhi in the presence of Indian and international dignitaries, including the Heads of the SAARC (South Asian Association of Regional Cooperation) nations. 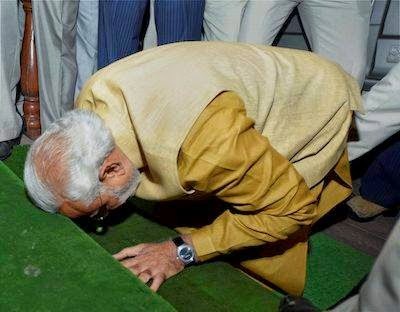 Narendra Modi was born on 17th September, 1950 into a poor family in Gujarat. He joined the Rashtriya Swayamsevak Sangh (RSS, a social and cultural organisation) at a young age to do national service. He joined the Bharatiya Janata Party (BJP) in 1987. He was responsible for the growth of the party’s presence in Gujarat. Modi is known for his election strategies. He led the BJP Party to power in Gujarat in 1995 and 1998 through his well-planned out strategies and their execution. In October 2001, when the Gujarat Government faced an acute governance crisis, he was asked by the Party’s leadership to take over the helm of the State as Chief Minister, in spite of his zero experience in the Government. After taking charge of the Gujarat Government, Modi faced several critical situations like the devastating earthquake in Bhuj, the Godhra riots and the terrorist attack on Akshardam during 2002. Modi was accused of inaction in Godhra riots and even alleged involvement. The Supreme Court acquitted him of all the allegations and charges. During the 13 years of his Chief Ministership in Gujarat, he proved himself as a development-oriented and good administrator. In September 2013, in spite of the resentment of senior party leaders like L. K. Advani, he was named the Prime Ministerial candidate by BJP. Since then, he galvanised the BJP cadre, which had remained frustrated after the poll debacles in 2004 and 2009. Narendra Modi travelled more than 300,000 kilometres across the country and addressed more than 5,800 meetings and rallies. The campaign theme Abki Baar Modi Sarkar’ - meaning ‘This Time, (it’s) Modi Government’ - and ‘Minimum Government, Maximum Governance’ appealed to the voters. Even when the opposition parties continued to taunt him personally, he pursued undauntedly, with his dream mission of forming an NDA (National Democratic Alliance) Government. In spite of the apprehensions that he would not be able to bring together poll allies, more than 20 parties joined him in the NDA alliance. Modi campaigned aggressively through the effective use of technology and the internet, to draw the younger generation and the middle class voters. His promise of the Gujarat model of development attracted most voters. UPA, (United Progressive Alliance), led by the Congress Party, could not match Modi’s zealous campaigning. Modi converted every accusation of UPA into an opportunity for himself and his party. For example, when Mani Shankar Iyer ridiculed Modi as a ‘tea vendor’, Modi capitalised on it to attract the poor section of the society. He held live discussions with the people across the country through video conferencing in what he called ‘Chai Pe Charcha’ (Discussions over Tea). His nomination paper was signed by a tea vendor. Various scams during the UPA regime, especially the 2G Scam and the Coalgate Scam were the main causes for the downfall of the Congress-led UPA Government. During their campaigning, the Congress focused more on pulling down Narendra Modi, than projecting their own accomplishments. Modi thus gained the centre-stage and capitalised on this opportunity to project his strengths and capabilities, challenging Congress’ mud-slinging. Narendra Modi was projected as a strong contender as Prime Minister. The Congress and the Third Front parties on the other hand, did not name any leader or Prime Minister candidate, to match Modi’s calibre. The Congress and the other Third Front leaders failed to present the prospective voters with any constructive plans or strategies and instead indulged in negative campaigning by canvassing about ‘Modi’s threat to secularism’, to the voters, missing the mood of the nation for a development agenda. The aftermath of these campaigns was the sweeping performance by BJP, securing 282 seats (NDA 336 seats) out of 543 seats. BJP gained absolute majority to form a Government on their own. Congress won 44 seats, failing to win even the opposition party status, which required a minimum of 55 seats.The other major parties which were supporting Congress either directly or indirectly, like the Communist parties, NC, NCP, DMK, BSP and SP lost their prominence. The massive victory of Narendra Modi reflects the anger of the voters and the desire for change. When Narendra Modi announced Mission 272+ (which projected a win of over 272 seats in the elections), to galvanise their workers to achieve a single majority, many were skeptical. But his untiring efforts and confidence in himself and in the system, proved him right. and listener, the expectations of voters are very high. The economic condition of the nation, the price rise, the chronic state of corruption, strained relationship with neighbouring countries, the issue of unemployment, unaddressed issue of power shortage, and many more challenges are awaiting his attention and redressal. His invitation to the heads of SAARC countries has sent out a message to the world that he is interested in good relations with other countries. Modi has created hope and confidence in the minds of the Indians. 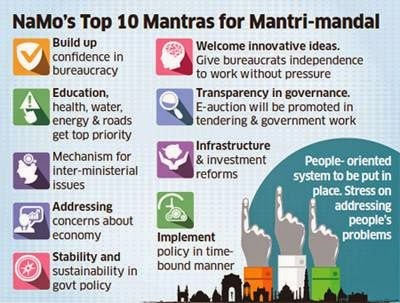 Immediately after taking charge as PM, he has also given a 10-point agenda to all his colleagues in the Government. He shows indications of proving himself to be an effective Prime Minister.